It’s a time-honoured tradition around this time of the year. 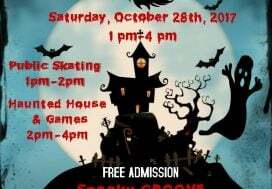 Kids start to get excited about the dressing up and trick-or-treating that’s just around the corner with Hallowe’en looming…but does anyone get costumes ready ahead of time? NAH!! Why bother when you can run around the house in a panic at 4:40pm on October 31st, trying to throw a cute, creative and entertaining costume together in 10 minutes or less?! ?…or maybe it’s not like that in everyone else’s house! 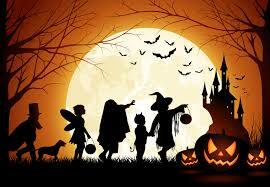 To save you that mad-dash, last minute experience, here are a few favourite costume ideas found on the web this year. A definite bonus: you’ll either have the necessary materials on hand at home or you’ll be able to find them for a buck or two at a dollar store. Thanks to Country Living magazine, DIY Network, Pinterest and Woman’s Day magazine for collecting some great sources of inspiration! 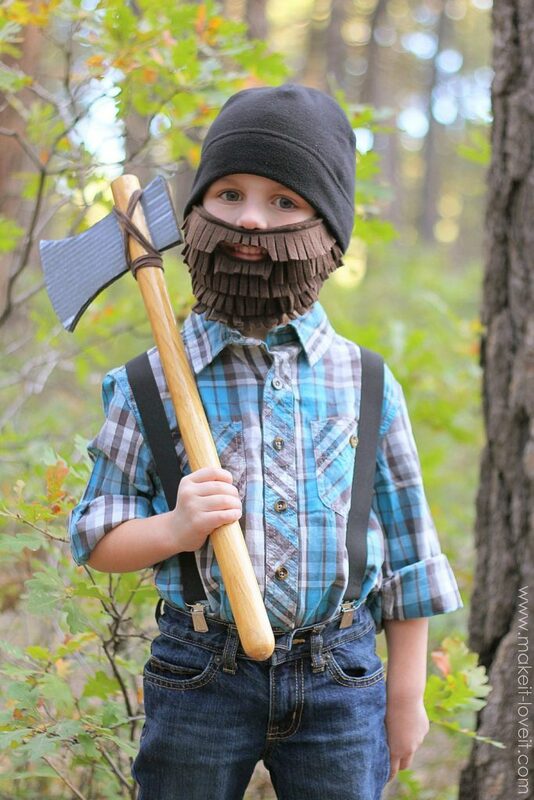 In our house we were more interested in Bob the Builder than lumberjacks but this costume is a great idea, particularly for rural areas like ours! You can craft a shaggy beard with felt and some hot glue and the axe can be made out of nothing more than a baseball bat, some cardboard and a bit of twine. Then all you need are jeans, a flannel shirt and a black toque…and who doesn’t have those? Being a big Johnny Cash fan, this is my favourite Hallowe’en costume ever! 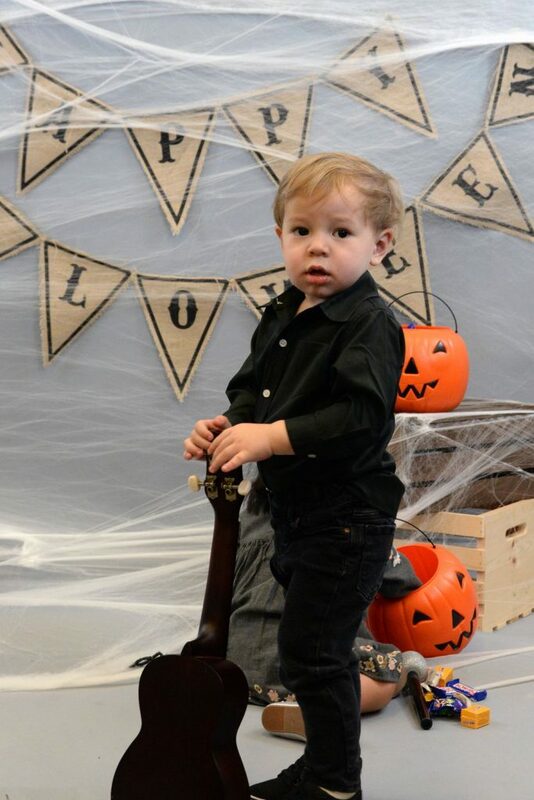 Dress your little guy up as “The Man In Black” to show both how cool you are and that you’re a genius when it comes to simple costumes! A great simple idea! 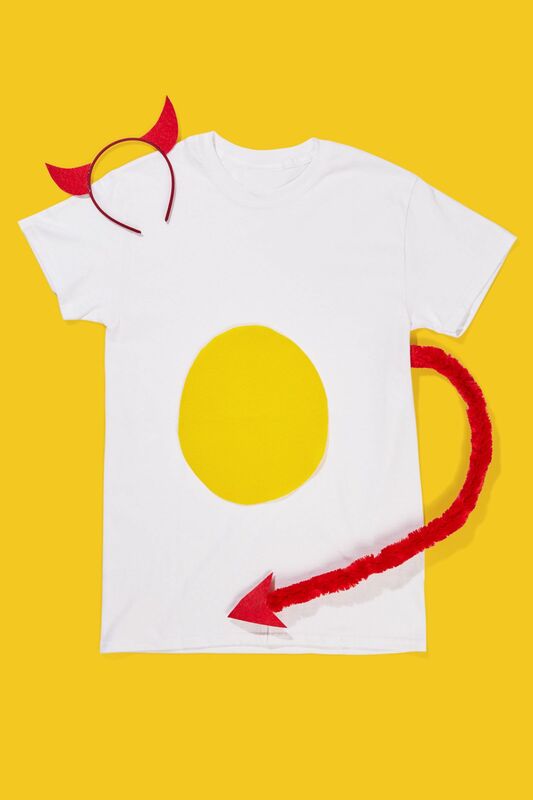 All you need is a white top (or a length of white fleece or even a sheet), a circle cut from yellow felt, some hot glue and a set of devil horns/tail from the dollar store. Wickedly easy! 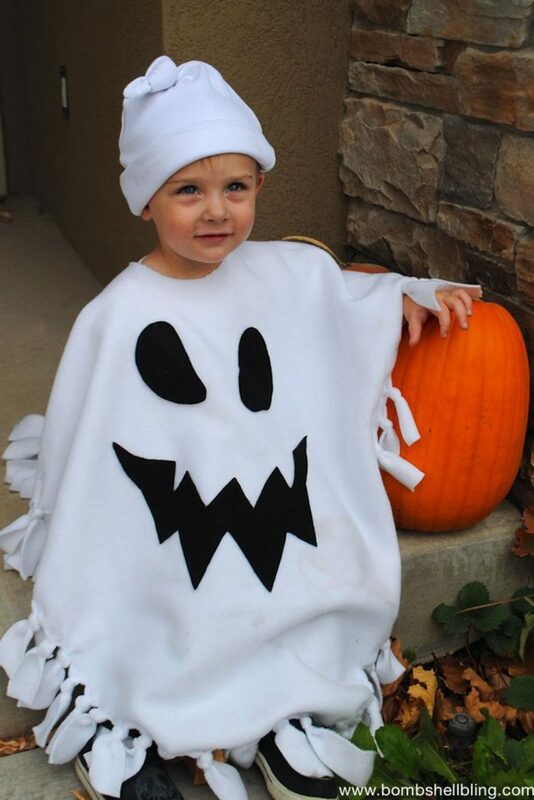 The ghost costume is a classic for a reason! Where was this warm no-sew version when we were kids? All you need is a length of white fleece, some black fleece for the ghostly eyes and mouth, some scissors and a hot glue gun. And the best part is this will easily fit over a snowsuit! 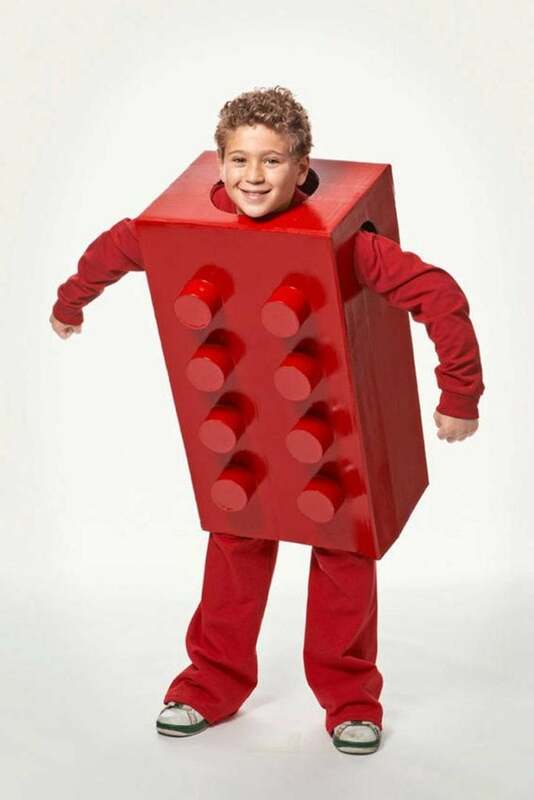 We had a couple of variations on this fun and easy costume when our girls were younger. 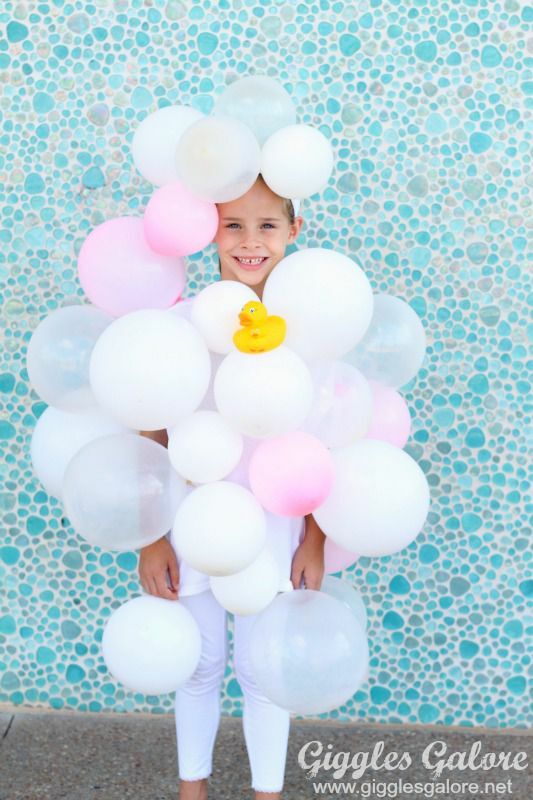 For the example in the photo, you’ll need balloons, a white shirt and pants, an inflatable duck and maybe a shower cap. Grace went as a bunch of grapes one year which meant the clothes underneath and the balloons had to be either green or purple and she needed a brown cap for the stem. Simple, cheap and very cute! All you need here is a top and pants in the same colour, a couple of empty large pop bottles, some tape, twine for straps and a little spray paint. 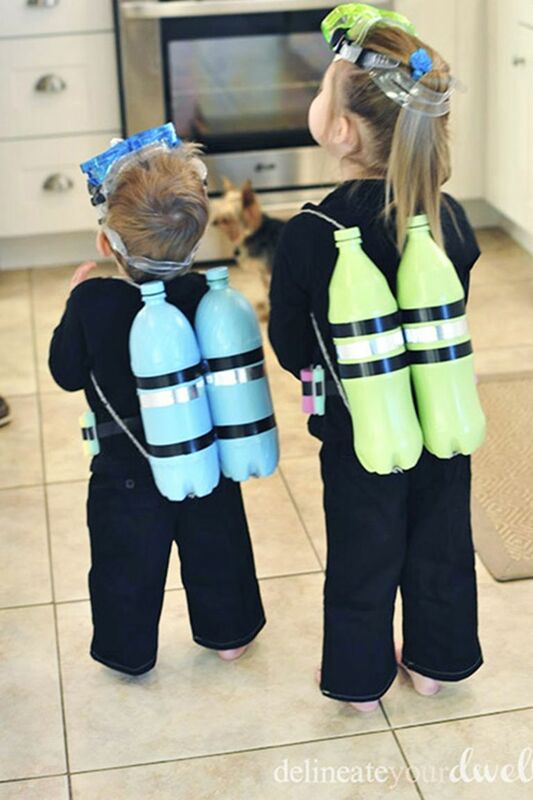 Then dig out the snorkel equipment and goggles from the beach bag and you’re all set! Find a square shaped box, get yourself a pad of construction paper and a pair of scissors and you’ll have everything you need to create this ode to a puzzling favourite from 1974! 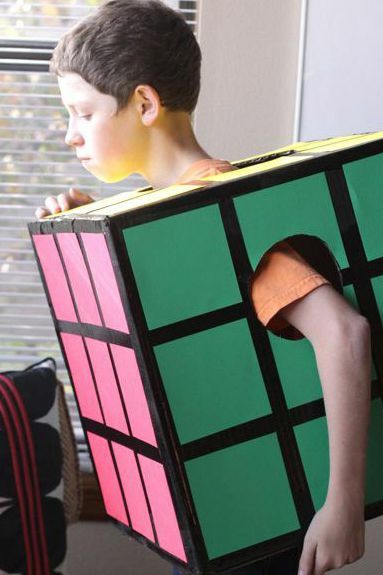 It’s easier to make this costume than to solve the puzzle that inspired it! Who doesn’t like some good old fashioned comfort food? 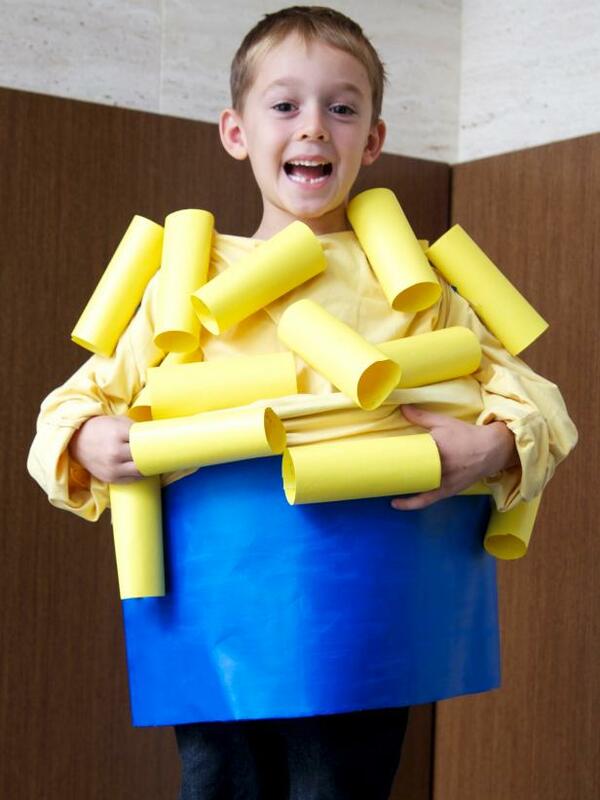 This version is easy to make with a yellow top, some paper towel and toilet paper tubes painted yellow (or just make tubes out of yellow construction paper), hot glue and a piece or two of bright blue bristol board bent around your waist and secured with a couple of safety pins. Some circular gift boxes, a large rectangular box and some high gloss spray paint will allow you to build a block that stands out in a crowd! A budding artist can get involved in crafting this DIY costume. 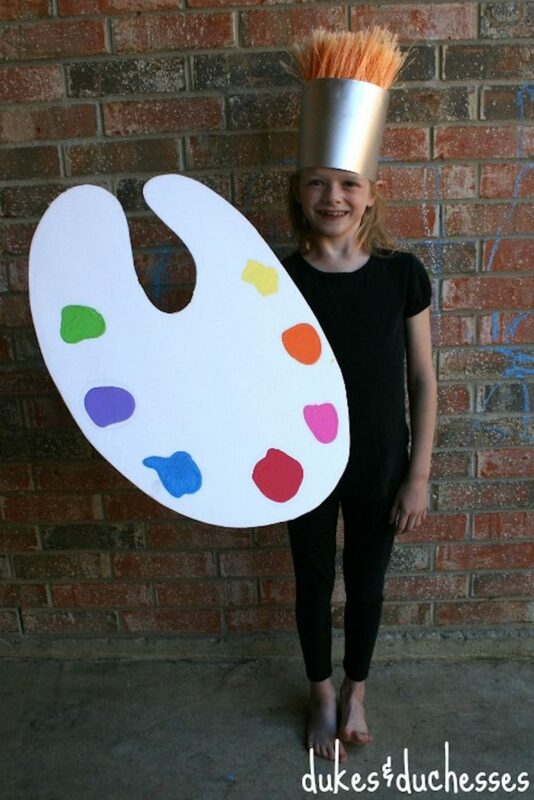 Dress in brown or black (the stick of the paintbrush), cut the shape of an artist’s palette out of cardboard and apply blobs of your favourite colours. For the brush bristles, all you need is some silver cardboard or construction paper and the bristles from a couple of dollar store brooms hot glued around the inside of the silver band…et voila, vous etes un artiste!